strawberries this Saturday at 11:30am. 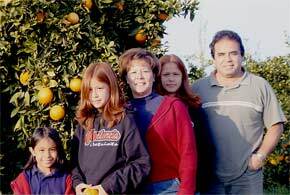 Twin Girls Farms: In 1989 Ignacio (Nacho) and Casamira (Cassi) Sanchez bought their first farm – a 6½ acre stonefruit farm. This was a great accomplishment for Nacho, whose parents were migrant farm workers in California. Nacho had always dreamed of owning & farming his own land. He and Cassi named their farm after their twin girls, Christyna and Serena, who were born in 1991. In 1996, they had another daughter, Savannah, and they have named some peach varieties after her, including “Savannah Sweet” and “Savannah Snow”. Twin Girls Farm currently farms over 150 acres of organic orchards, specializing in stone fruit and citrus. Triple Delight Blueberries: Mark and Kimberly Sorensen named their new farm after their three daughters, Johannah, Elizabeth, and Olivia. They started by marketing their blueberries to one weekly farmers market as a family event and sold the rest to wholesalers. Now they sell their entire harvest directly to the consumer and attend 23 CA farmers markets. Kimberly explains that selling directly to consumers is very important to the farm’s philosophy and they are happy to form relationships with their customers. Our “Meet the Farmer” interview will be with Kim and Mark on Saturday June 19th, their last day with their delicious “triple delight” blueberries. Four Sisters Farm: Nancy and Robin Gammons purchased a five acre plot of land in Aromas and began farming in 1977. The Gammons’ approach to farming has always been organic and ecological, and they have a strong commitment to maintaining a natural, healthy ecosystem on their property. The Gammons have four daughters – Lucy, Jill, Dusty and Prema – for whom they named the farm. All four grew up on the farm and are now grown. All four were active on the farm over the years and helped with sales at farmers markets. Jill is considering returning to the farm and continuing to be involved with farming in the future. Brooks and Daughters Sprouts: Formerly a cheesemaker, Jim Brooks and his wife Corie launched their sprout growing business in 1996. They named their business “Brooks and Daughters” in honor of their two young girls. The business has enabled Jim and Corie to spend the time they need to care for their two daughters, and so it has been a part of building a sustainable quality of life. The Brooks start all the sprouts in buckets of water outdoors. As the seeds begin to sprout, they “plant” them on 17” x 17” open bottom nursery flats and move them into the greenhouse. In the winter, it takes about three weeks in the greenhouse for the sprouts to reach market size, but in the summer it only takes one week.